Our almost 3-year-old son met Santa Claus for the first time last week during Hanukkah. He loves live music so we took him to a local holiday pops concert as a Hanukkah present. Santa showed up to lead Jingle Bells and other holiday – well, Christmas – tunes. It looked and sounded like Christmas everywhere we went. Egads. Have we committed a Hanukkah faux pas with our child? I don’t think so. It’s okay for him to learn that people celebrate different holidays around the same time of year. It’s okay that he brushes elbows with Santa, a figure important in the lives of many of our friends. Christmas is not a holiday we celebrate, but it is a big presence in America. It is a challenge, though, to figure out the best way to explain Christmas trappings to a child at the beginning stages of developing his Jewish identity. At the pop concert in our town of Lexington, Mass., Santa and elves stood on the stage and jingled bells to Jingle Bells and Rudolph the Red-Nosed Reindeer. Simon bounced a little to the music and stared wide-eyed when Santa alked by us and greeted children. I paused. “Oh, he’s the man in the red suit,” I said. Why I did not say Santa Claus, I’m not sure. Maybe I was not yet ready for Santa to become a part of my tot’s vocabulary. We left the concert, walked in Lexington Center, and ran again into Santa. He was handing out candy canes and asking children what they wanted for Christmas. Simon saw the red and white candy. “Can I have one?” he asked. We walked by carolers. We were the only audience, and they asked if Simon had a favorite. “Jingle Bells,” I offered. They sang, and Simon smiled. Yes, it was the third night of Hanukkah. But the Dreidel Song, while cute, cannot match the charm of Jingle Bells sung in harmony by a group of enthusiastic carolers ringing bells on a crisp, clear night. During dinner at a local Chinese restaurant, Santa made a repeat appearance. Simon this time was not that interested. After dinner, as we were heading to the car, he spotted someone dressed as Winnie the Pooh. “Pooh!” he shouted, and dragged us over. We ran into a neighbor and her two boys, ages 3 and 5. The boys took turns hugging Pooh and exchanging high fives with the costumed character. Simon was oblivious to the scene behind us, hundreds of Lexington residents gathered to admire the lit-up town Christmas tree. 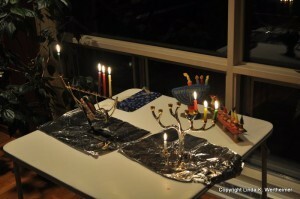 At home, we lit the menorah candles and sang prayers and Hanukkah songs. We listened to CDS mostly of Hanukkah music. Soon, Simon was dancing and begging us to bop around the living room with him. We had dubbed this music night. It became much more than that. Simon got a firsthand taste of the music and characters of Christmas. At his day-care center, his teachers say they have read books about Hanukkah and Christmas so the children can get a sense of the season’s different holidays. Perfect. Simon should learn about the holidays that his friends celebrate, and vice versa. We live in town with a large Jewish presence. Lexington has a Reform temple, Conservative shul, and an Orthodox Chabad center. Simon attends a weekly preschool class on Judaism along with going with us to Tot Shabbats and other events at our temple. Our house is starting to fill with Judaica items made by Simon –painted Shabbat candlesticks, a play menorah, and a decoration of a dreidel kid, aka Simon. 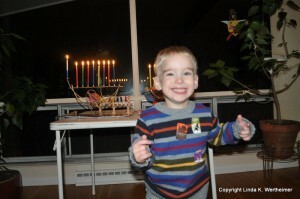 Simon, his day-care teacher told me the other day, knows that he celebrates Hanukkah. That – along with his growing awareness that he is a Jew – is what counts. This post originally appeared on Jewish Muse. Note: Santa photo is used courtesy of freedigitalphotos.net.